AeroGauge is a futuristic hovercraft racing game for the Nintendo 64 released in 1998 (1997 in Japan). ASCII's AeroGauge runs basically along the same conceptual lines of play as Psygnosis' Wipeout XL or Acclaim's Extreme G. The main difference is that the vehicles in the game fly instead of staying a few meters over the track, so it's possible to maneuver them in the air (unlike the previously mentioned games). 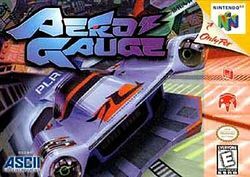 Racing futuristic vehicles on futuristic tracks, the player must first qualify for races before competing in AeroGauge. The courses are much more open than standard racing games, allowing free reign in most cases where the player isn't forced into one of the many tubes. Players have the option to choose between ten different vehicles, including a secret bonus one, in a racing championship over six tracks. This page was last edited on 3 April 2010, at 06:38.